The Food Network Magazine doesn’t always grab my attention, but June’s issue jumped in my cart. With fifty recipes for condiments, new iced tea ideas, fresh fruit cocktails, hot dogs and make your own pasta salad concepts I’m going to be cooking out of it all summer. I added some of those pre-grilled vegetables, vegetable rotini and a tad more garlic and lemon to their sauce recipe. It’s so good I can’t stop sneaking forkfuls. Now I can’t wait to try the other sauces and suggestions! Summer here I come. Mix all the ingredients together. Toss with pasta and grilled vegetables, below. 1. Make the pasta according to package directions. Drain and run under cold water. 2. Meanwhile, turn the grill to medium-high. Slice the onion and zucchini large enough they don’t fall through the grates. Season well with oil, granulated garlic, granulated onion, salt and pepper. Toss to combine. Grill until char marks form and veggies are tender. Chop into small bite sized pieces and cool to room temperature. 3. In a large bowl, toss pasta with dressing and vegetables. Add salt and pepper to taste if needed. Serve immediately or chill until ready to use. Sauce recipe adapted slightly from Food Network Magazine, June 2011. Pasta & picture by Laura Flowers. This sounds absolutely tasty, Laura! Perfect meal for this time of year. Yum! 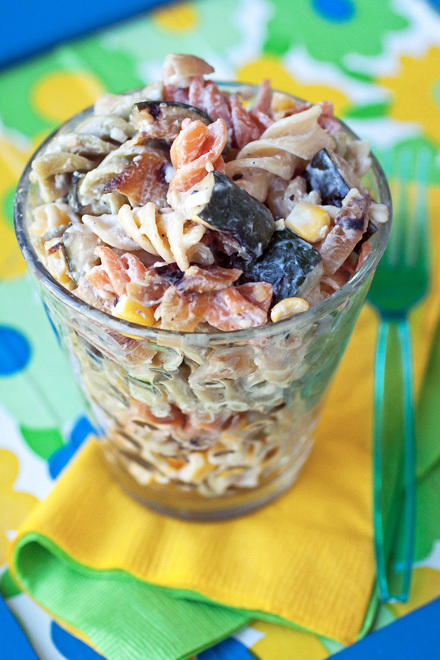 I love the vegetable mix in this pasta salad. What a great summer salad! And I love the way you are serving it...great idea! Definitely one of my favorite parts of summer is all the summer salads that abound! I love the garlicky parmesany sound of that dressing! Yummm!! This looks delicious with the creamy garlic dressing! Wow! More great grilled vegetable ideas! And I've been antsy to try some of that stuff in this month's Food Network mag, too! This looks good Laura. Looks like summertime is kicking off right. Now just need some friend chicken and potato salad to go with it. What a fabulous summery meal! I loooove grilling veggies. This looks so yummy, Laura! And great for a picnic to enjoy the lovely weather.